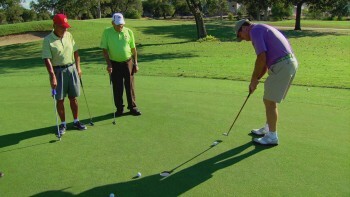 In this episode of the Secret Golf, Steve Elkington heads to San Antonio for a Texas sized history lesson, talks Tillinghast Designs, and has a putting contest with PAGA guys. REID MEYERS: This facility oozes history. When you walk onto the premises, you just smell it, touch it, feel it. NARRATOR 1: --and makes a monumental discovery. MAN: The first Rendition of Mount Rushmore was done here in the shadow of the flag stick of number 17. NARRATOR 1: And also manages to find some time to squeeze in a little old fashioned putting game. MAN: We play this game [INAUDIBLE] stymie. THEME SONG: One, two, three, four-- we've got the Big Show revvin' and ridin' around the map. Where we're going next, we just can't say. So grab your clubs. Let's hit some balls. We're making friends and playing golf. The Rural Golfer's coming your way. NARRATOR 2: In Texas, the history of golf runs as deep as the Lone Star state's pride. And without question, the core of Texas golf history is Brackenridge Park. -This facility oozes history. When you walk onto the premises into that wonderful old clubhouse, you just smell it, touch it, feel it. In 1922, a guy named O'Brien-- the then sports editor of the San Antonio Light newspaper, said well there's these big golf tournaments going on in the east. And we have great weather here in February. Why don't we have a golf tournament here. He rallied some guys and created a $5,000 purse for a tournament here. So the next year, they all came again. And they raised $15,000 in 1923, paid $7,500 for the purse, used the other $7,500 to construct that clubhouse. STEVE ELKINGTON: This is where the great Texas players started their careers-- Hogan, Demaret, Jackie Burke, and all those Texas guys. REID MEYERS: We have audio and video of guys like Byron Nelson telling stories about what they did during certain years at O'Brien. 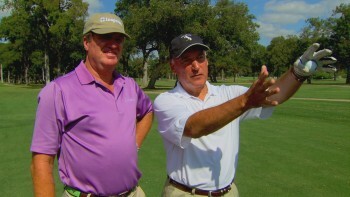 -I went to the Texas Open [INAUDIBLE] and I paired with Bob Cruickshank. And I still have the trophy sitting on my case now-- Second Place, [INAUDIBLE], 1930. -The condition of the course back then was so ragged, he said, that they used to even hit off mats which even adds another element of lore to this place, right? But it still bought the best fields. All the guys that were great came here and played in this event. It wasn't one they skipped. They all came to San Antonio. NARRATOR 2: A renovation restored Breckenridge Park to its original condition. And as the oldest public course in Texas, it's a treasure today just as it was to the legends of the game from yesteryear. REID MEYERS: 1915, it was constructed. STEVE ELKINGTON: 1915-- that's a long time ago. REID MEYERS: That's a long time ago. STEVE ELKINGTON: I always like to go to courses that, you know, great players have played at. That you played the same hole that Hogan played and all that. I've heard about Old Breck for all these years from Jackie Burke. 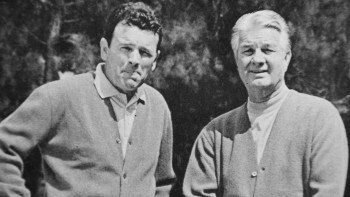 It has the most extensive list of champions that have come through the world of golf, that we've all known their names. NARRATOR 2: In the mid 1900s, just feet from Breckenridge Park Golf Club, an organization rich in Latino golf history was formed. -It started in '38, really, with a group of golfers named Fore Golfers-- F-O-R-E. Then during the WWII, a lot of them had to go to the armed services. Many didn't return. And the ones that did return re-established themselves and renamed the club the Pan American in '47. NARRATOR 2: Spanning the United States, the Pan American Golf Association is a nonprofit organization many chapters and accomplished members. -We're one of the oldest and largest amateur golf associations in the country. It started here in San Antonio and then it grew within Texas. And then it went beyond Texas borders. Now we're 43 cities throughout seven states throughout the country, about 3,000 members. NARRATOR 2: And those members are on a mission to create a passion for the game in men and women of all ages and ethnicities. Another more light-hearted mission among the group's oldest chapter is to pass both the time and a little cash at Breckenridge Park. -'73 is when it actually really took over-- the stymie game. -We were fortunate that Brackenridge has a beautiful putting green facility here. -Guys would show up, see us putting, and come and ask if they could join. And sure, anybody's welcome. WILLIE MARTINEZ: Some guy would walk up and say can I get in? So, well we're putting dollar stymies. And they looked us- what's stymies? WAYNE GARCIA: Stymies means if somebody's in front of you, that's too bad. You've got to figure it out. -If you've got a guy that blocks you, you could step on the ball and chip it over him and try making into the hole. But at the same time that you missed a putt, you don't want to go too far past the hole because you've still got to putt out. -If you bump somebody, you pay everybody. -But if you don't bump, you're going to make some money. -If you three putt, you play all the two putters. And you change your batting order depending on how you scored in the hole. -And then it just goes on like that all day long. -Everybody said it's about the money. It's not about the money. It's about the camaraderie. -We have a lot of fun. We get about from 4 to 12 guys out here. -We had 17, 18 guys at one time. -Putt for about three or four hours almost five days a week. We're off on weekends. We don't come in on weekends. NARRATOR 2: And on a beautiful South Texas morning, the fellows are about to add one more to their game. STEVE ELKINGTON: What are we doing? -We're tossing to see who's first. STEVE ELKINGTON: Wait a minute, we're tossing to see who's first? -OK, all right, here I go. -No he's not. No he's not. STEVE ELKINGTON: OK, so what's the game? What's the-- what's the-- what are we playing for? -We're going to play stymies. -Two dollar on the ace. -And we're playing true stymies, like what you all did in the '50s? -Yeah, the guy that bumps first, he's out. -Hey, by the way-- hey, hey, I bought an old 1952 [INAUDIBLE] which Jackie Burke-- he won four tournaments in a row and this was the first tournament that he won it with in 1952 at this course. -If you lose enough, can we own it? -He was showing off his putter that he's got. And I said well, that's good. Mine only costs 99 cents at the Goodwill. -Hope you guys got enough money. -You guys do this every day? -Except weekends-- we don't do it on weekends. -There's a bump! There's a bump! Oh! -Because you had his ball, you got to pay all of us? -You square up on the spot, do ya? -Watch this. Watch this. Oh, man. I can go home now. There's one or two guys are better than the rest and that's the guys that we want to beat all the time. -So you guys play this every day? -This is the guy to beat. STEVE ELKINGTON: With the red hat? Yes, sir. He lives here. STEVE ELKINGTON: He puts it out on the toe and has that little draw shot in there. That's what he does. I've seen that move. Did you see that tour stroke there? Did you see that? Did you see that? In. -What do you mean uh-oh? -All right. I want to do this again. We haven't had a stymie yet. I know. I saw the grain go up that way. STEVE ELKINGTON: That was a pull, wasn't it? I see the grain goes back over here. Oh, here's the stymie. Oh! Here's a stymie! So everybody can see what's going on here. He's got a little gap. If you hit his ball, it's a dollar for everyone. -And he's stymied here. We got it. OK. You're away. You go. Bingo. -This one. We'll do this one. Wait. Wait. Wait. What are we doing here? STEVE ELKINGTON: Oh, so this is the old stymie rule? -If you got a guy that blocks you, can step on the ball and chip it over him to try to make it in the hole. WAYNE GARCIA: Just push it down a little bit and watch this. STEVE ELKINGTON: So that's a gimme, right? STEVE ELKINGTON: I'm not hitting you. I'm going right in the hole right there. Bingo. -Another collection here. I think this dude has played before. NARRATOR 2: As one of the most prolific golf course architects in the game's history, A.W. Tillinghast is credited for nearly 300 designs. Among them, Brackenridge Park. Born in 1874, Tillinghast's design resume is one that ranges from daily municipals to major championship layouts. -His architecture has stood the test of time. You know, he's done Baltusrol, Medina, where we saw the Ryder Cup. They're still playing major championships on his courses. NARRATOR 2: Retained by the city of San Antonio in 1915 to create Brackenridge Park, Tillinghast's bold and unique style remain prevalent today despite a modern sign of the times. REID MEYERS (VOICEOVER): He constructed it around the San Antonio River, which is right here. And in 1968, the city of San Antonio ran a highway through the back nine and cut off several of the holes. And when they did that, they filled in these wonderful bridges that were sitting next to here. The ones behind me. And it was a tragedy. So when we saw all of this, we said, we have to take it back to what it was. -Tell us what's so awesome about Tillinghast's courses. REID MEYERS: Flat bottom bunkers. Big bunkers. STEVE ELKINGTON: So you didn't really have a side hill [INAUDIBLE]. You came in, they're quite deep, but they were flat on the bottom. NARRATOR 2: Noted for his square greens, flat bottom bunkers, and reef bunkering, Tillinghast is among those enshrined into the World Golf Hall of Fame in 2015. -The bunkering starts out on the right side of the fairway. And then, about every 30 yards is another large bunker. And then, they curve their way across the fairway and then up toward the green. It was a nuance that he did on a number of courses. -You feel like, as a player, it's going to bottleneck you somewhere. -It's all you see. And this is only 6,300 yards along. It's a short course by definition. The tee boxes are literally next to the previous green, so it's very walkable. STEVE ELKINGTON (VOICEOVER): The courses that he's done are treasure courses. And big things that played on those courses, big tournaments. And they're revered. And they've written books about it. So he must have been right. -I want to show you a shot that gets it up high out of these Tillinghast bunkers. I turned that club face open, so there I am normal. I turned it opened as fast as I can. So now you can see the golf pride back there. And now, I grip normal. The next move was always-- I have the ball up front. And as I take it back, I want to open the club more. So I'm going to crank on that left wrist and turn that club face so it's almost pointing back at me with those grooves here. Back at me at my head. The reason I've opened it so much, I can throw with that right hand and never close the club. You see how nice that came out? That's the tip to get out of those deep Tillinghast bunkers. REID MEYERS: We're walking into what we call the Borglum Studio. It's the first building on the entire property. It was constructed in 1885 by George Brackenridge as a water pump house. -No more than 30 yards away from Albrecht Clubhouse, we are in a building that when people find out what happened in here, they're going to be marveled. REID MEYERS: Right. A magical thing happened. In this room, Mr. Borglum did his initial rendering for Mount Rushmore. He would go around the state of Texas selling sculptures to city fathers for their town squares. That's how he made his living. But what he really wanted to do was another Stone Mountain. And in this case, what he dreamed up was Mount Rushmore. And Mount Rushmore was are initially modeled and envisioned in that little building. STEVE ELKINGTON: You're telling me that Borglum sculptured, designed, first rendition of Mount Rushmore was done here in the shadow of the flagstick of number 17? Look, I got goosebumps on my arm. Look at them. So 16 years, these two historical things were happening. One on one side of the glass. One on the inside. There was golfers like Hogan, Snead, Demerit, Burke, Mangrum. Hard to believe that, that much talent was there and that much talent was coming through here simultaneously. Unbeknownst to one another. Rewriting history to a certain degree. I wonder if he ever saw the golfers go by and thought they were crazy. And I wonder if the golfers ever looked in and saw that guy messing with the clay and thought he was crazy. I wonder if they ever met eyes, because it was just there. I mean the out-of-bounds stakes just there. I mean someone must have it their ball out of bounds right here. Borglum was out there. Had to be. John no doubt was a best putter. And he had a stroke almost like Jackie Burke. He was in and made that thing just top spin. -I'm a risk putter, which is old school. Guys don't do that anymore. I line my puts up on the toe, which is the deadest part of the putter. -You got it on the toe. You go in and then you turn it over, do you? -You're in there close to it. -OK. And you start in the toe. But you come out and you hit it in the center there. So it feels like you're coming up and over it more or less. Is that right? -If you keep putting long enough-- you might have been a bad putter, but after you put every day, you learn to become a pretty putter. Jackie Burke puts this in front there. That was old school. And then bang. Right there, right? -My game overall is just pretty good. But I can put. I can make anything from anywhere. And the guys know me already. Hey, don't get John on the green because he can make anything. -I got the read right here. WAYNE GARCIA: That's a good line. Yeah. That's got him. That's got him. That's got everything. WAYNE GARCIA: That's a bumper. That's a bumper. STEVE ELKINGTON: So you lose to everybody again. -Don't say it so loud! WAYNE GARCIA: He didn't. He didn't make it. He did! He's got everybody now. Oh, it went. It rolled. -There's some pro's here. Is this is a gimme? -There's some more money. There's a lot of money. -I tried a new stroke and it didn't work out for me. Here's a dollar. -$1 Hey, I'm going to go look at the course. And I want to thank you guys for showing me the game. And I appreciate you guys and how much love you guys [INAUDIBLE]. -I got a question for you. -What are you doing tomorrow? -You got time tomorrow? Come on by. -So [INAUDIBLE] was right there. I said, where's that mallet putter you bought yesterday? And he said, I'll get it out of the car. So I went to enter the tee with this thing. And I just used my regular gripping stance. -That's your move right there. -And I just made my gripping stance. And I won the tournament. And then I won every one for a month. -Well, they already couldn't make these things fast enough. STEVE ELKINGTON: I finally got to come to old Breck. Jackie Burke had told me stories about Breckenridge Park for years. I wasn't quite anticipating the passion that I found on the putting green when I first arrived today. I heard this is the place. -Well, you're at the right place. STEVE ELKINGTON: It was just awesome. I got to talk about the great A.W. Tillinghast, the designer of this golf course. -It was one of his originals. And we're delighted that it happened here. We're delighted that the Texas Open started here in 1922. And that now, people can come from all over to play here. And they do. They come from all over the country, all over the world to play here and enjoy the history and tradition of this place. -And then of course, I had no idea what was going on in the Borglum Museum. But my god, we had two historical things going on here for 20 years. Where we had men that changed the shape of the world in golf. And a man that carved a monument out of a mountainside simultaneously unbeknownst to either group of greatness. You know, I'm not really a history guy, like super history. I'm more geography. But today was wonderful. It was the first show we've done that was sort of put together through Twitter. Shana's the one that started it. Hey, Elk. You've got to do this with the Randy Rogers Band. SHANA: The idea came to me me, because I was sitting on the back porch with my parents and we were watching Rural Golfer. And I'm a huge fan of Randy Rogers Band and we've been friends for a long time. So I kind of got the wheels rolling. And was like, this would be such a great idea. -She tagged me in it. So I was like, I love golf and man, this would be cool.